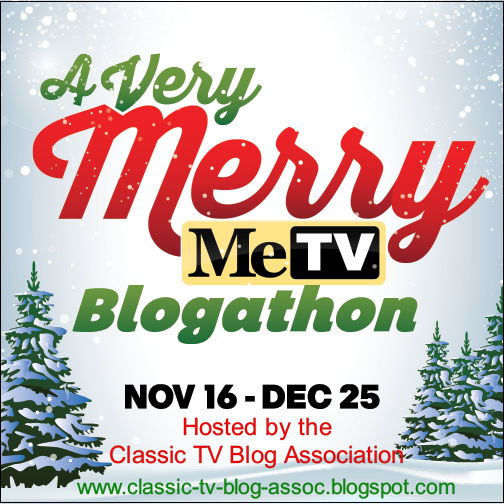 The refrigerator is still full of day-after-Thanksgiving leftovers, but apparently it's already Christmastime, which means it's also time for the Classic TV Blog Association Christmas blogathon. This year's event is a little different; rather than being grouped during a single week, it takes place throughout the entire season, and in fact as already started. My own contribution won't be up until Christmas Eve, but you can see the complete schedule here, and doubtless I'll be referring to them throughout the coming month. In fact, The Last Drive-In gives us a sample, with the Christmas episode from the inaugural season of Thedy Griffith Show, a sentimental yet witty version of A Christmas Carol that shows the essential humanity that exists in Mayberry. Comfort TV reminds us that the classic Bob Newhart Show was one of the few with a Christmas episode every year, and he ranks them all the way up to the top. 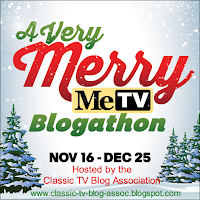 And the wonderful Christmas TV History blog is in its element, with a look at the 1980 Christmas episode of M*A*S*H, as well as a list of upcoming Christmas TV episodes. But let's not forget Thanksgiving quite so soon, The Flaming Nose remembers the 1967 Thanksgiving episode of That Girl, involving two families and a Thanksgiving turkey. Here's a great post for those of you looking for the perfect Christmas gift for that classic TV or movie buff - Classic Film and TV Cafe's shopping guide. Aside from the fact that my (non-TV related) book isn't there, it's a terrific list! In non-holiday related doings, The Horn Section looks at another classic episode from Love that Bob, while Lincoln X-Ray Ida does the same with Adam-12. And that's it for the day after Thanksgiving, but be back here the day after the day after Thanksgiving, when this week's issue of TV Guide takes us into December.